Golden Pearl boast an impressive array of convenient and stylishly designed facilities staffed with efficient and helpful professionals. My Taste Restaurant offers Thai, Japanese, Asian and western cuisines in a serene and comfortable environment. Our chef excels at Thai classics such as Tom Yum Goonk and Pad Thai, subtle Japanese delicacies, while juicy steaks are available for people in need of western fares. Restaurant & Room Service opening time: 06:00 - 23:00 Hrs. On the fourth floor is our fitness center where you can work out while enjoying the view. 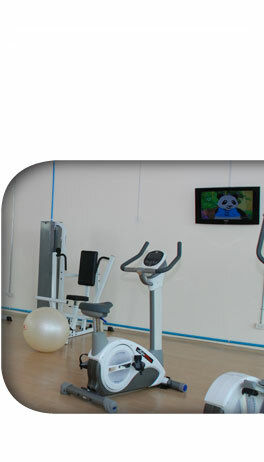 Modern equipment will ensure beneficial and agreeable exercise. An elegantly and practically designed modular function room will host all your functions and events, be it a formal meeting, a seminar, or a party. The room features modern technology and our professional attendants will make sure all your needs are met. Twenty people can be accomodated very comfortably. Whether you need to send faxes, book air tickets or have some documents translated, our staff will assist you with efficiency and courtesy. With us, anything is possible! Located in the lobby, the 24-hour Internet Corner features computers available for our guests. High speed Internet connection is provided. Our roof-top outdoor swimming pool is there for you to enjoy a splash in the morning, some great sunbathing in the afternoon or some quiet reading in the evening. 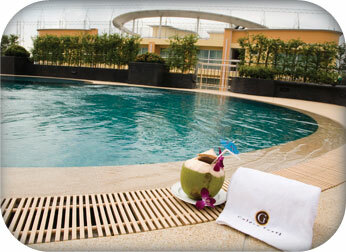 The area is breezy and nicely beautified with attractive plants and flowers. There is also a kids’ pool for the younger ones. The 24-hour-security underground car park offers shelter from the outside elements. The car park can accomodate up to 100 vehicles.